Scholars and journalists have paid significant attention to the contemporary Fundamentalist tendencies of southern Protestantism. However, many studies neglect to consider how the Fundamentalist controversies that roiled the Baptists and Presbyterians of the North during the 1920s affected the Southern Baptist Convention schism of 1970-2000. 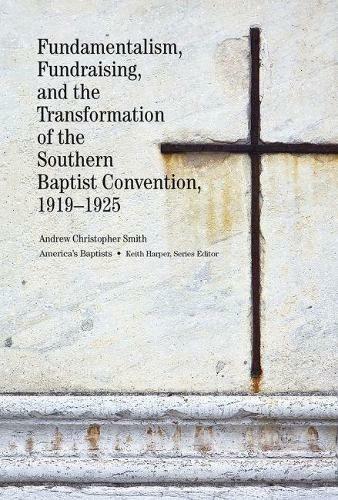 Fundamentalism, Fundraising, and the Transformation of the Southern Baptist Convention, 1919-1925 explores the scope and character of the interaction between Southern Baptists and early Fundamentalism during the late 1910s and early 1920s. By focusing more closely on the Southern Baptist Convention, Andrew Christopher Smith examines the interaction between the northernFundamentalist movement and southern religion during the era. Though scholars agree that Fundamentalism is not native to the South, no book thus far has considered the effects of the Fundamentalist movement and how it influenced southern Protestant denominational organizations, independent of southern rejection of Fundamentalist-sponsored interdenominational evangelistic and educational institutions. Smith proposes that Fundamentalist ideas, lingering in the atmosphere of the South after wafting there through hearsay, national religious periodicals, and the secular press,likely influenced Southern Baptist self-understanding during this critical period. Examining documentary evidence, Smith explains that following the First World War, Southern Baptists pushed toward bureaucratization. The "Seventy-Five Million Campaign," a fundraising and organization-building drive that the convention approved in 1919, was the denominational movement through which the selective appropriation of Fundamentalist ideas occurred. Exploring the interplay of Southern Baptist claims and northern Fundamentalist precepts, Smith fills a void in scholarly examination of early-twentieth-century Baptist history.